She lived in the house that Mr Roland Shearer lives now, up Seabank. She has two daughters - Freda and Flora. I am proud to say this is my Mum. She lived in Rossal, Seabank Rd. which is now owned by Dolan and Doris Shearer. This is my lovely mother. 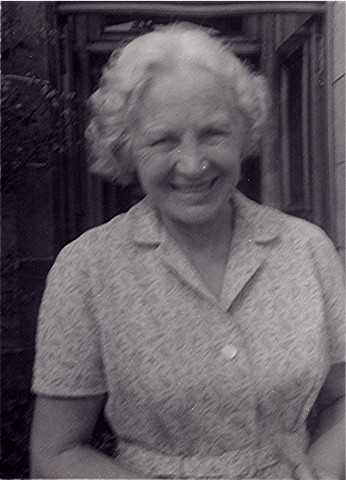 She was born in 1905 at Invergordon Castle where her father, Robert Hill, was a coachman. She was one of seven surviving chilren of Robert and his wife Mary (Munro), and later they lived at 46 Clyde Street. In 1939 she married my father, Angus Ross, who was a farmer and livestock dealer. Rossal was built for him and his two teacher sisters and his mother in about 1915. Mum organised the Invergordon Swimming Club and was active with the Horticultural Society. As well as being mother to Freda and me, she was a loving grandmother to five grandchildren born before her death in 1976. Hi Freda/Flora - I can just remember you both when I was a very young boy learning to swim at the old pool. I was interested to hear of your mother being born at the castle. I bought 21, Saltburn Rd in 1986 - you may remember it as the house where Cochrane the School Dentist lived. I later discovered a connection to the castle which must date to a similar time to your grandfather's work there. When I bought the house there was an old carved sandstone stone about 6 foot by 2 ft set into the front garden - it looked a bit like an old tombstone actually! After some research it turned out to be the Marriage Stone from the castle and that the original owner of the house was a man called John Munro nicknamed "Jock the Tin" (I believe the house was also built in 1915, the same year as Rossal.) He was apparently the Gardener/Handyman at the castle and I can only assume that when the castle was demolished the stone was either gifted or "acquired" and was set in the garden. I felt it was worth preserving as a bit of local history and it was suffering weather damage and I donated the stone originally to the Community Council and it is now an exhibit in the Invergordon Museum. By the way it actually took a crane to lift it and no bodies underneath! Would there have been any connection between this Munro and the Mary Munro you mention? Hi Graham, think his nickname was Jock-The-Ton, known to my grandparents and remember his name coming up in conversation. Hi Graham/Harry, that's really interesting about the Marriage Stone from the Castle. My parents knew the man called John Munro, and they called him Jock-the-Tin, but I never knew why. He lived near Agnes Cunningham. I'm pretty sure he wasn't connected with the Munro family my grandmother came from. They were from Easter Ross, and my grandmother Mary Munro Hill was brought up at Rookwood, by Balnagown, where a lot of her family worked at the castle. My grandfather Robert Hill was not local; he was born in Broadstairs, and came north from Kent to work as a coachman. I had almost forgotten about Mr Cochrane the dentist; that brings back bad memories. Thanks Harry - sounds a bit more logical than Tin right enough - I got the info fron my Aunt Cathie, unfortunately her and her generation are all gone and it is very difficult to get info. I often wish that I had asked more questions when I had the chance. Hi Flora/Harry. Looks like it was Jock the Tin after all - we may never know why! Re Cochrane, Flora - can't you just hear that drill? I think Agnes Cunningham lived at No 19 next door, incidentaly now owned by my brother Sandy. The Invergordon 'Off the Wall' site has an interesting document on old Invergordon by Ina Macleod, which references other The Tin people. Click on documents then open the one for Ina Macleod. Hi Graham, old Jock lived in your house when we moved into Bella Vista in approx 1958. He was widowed and my mum always cooked fish and chips on a Tuesday and I used to get sent over the back fence to give a plate of it to Jock. He opened the door took the plate and handed me a paper bag with three sweets in it, one each for mum, my brother and I. He once gave mum a jar of his late wife's beads for me to play with. I don't know if anyone remembers before the distillery was built? It was the site of the old RAF camp and just opposite Golf View Terrace, on the camp side, there was a building with a chimney that the old chaps used to meet in - there was old Jock and King (he had a greyhound called smokey and was the local grave digger) and a few others all sat with their mugs and pipes around this stove. Maybe someone like John Lennox who used to live up that way would remember who else went there. I know this is a long ways back but my distant relative Alexander Munro was a gardener in that area in 1790 when he married a McKenzie lady and moved to RedCastle by 1793. Alexander was from Kiltearn acording to records.